In this week’s gospel, we fast-forward about 30 years. Last week, we still had the infant Jesus being acknowledged as holy by the Wise Men. This week, Jesus and his cousin John are grown men, and John has been engaged in his ministry as the prophet who foretells the coming of the Holy One of God. As our Gospel reminds us, the people are filled with expectation. John’s preaching of repentance and pronouncement of the sinfulness of the people has had a galvanizing effect on the people who have come from all over to hear him. John pulls no punches: In the gospel of John it is recorded that when the leading men of the people show up to hear his message, he calls them a “brood of vipers.” Nice. Such preaching might be met with fear and shame—except that John also combined his preaching with baptism. The meaning of baptism at the time of John was a ritual cleansing—it did not wash away sins, but indicated someone’s desire to live a purer life. Baptism was also a ritual anointing—a setting apart of someone. John urges his followers to be baptized to prepare for the coming of the kingdom of God. That’s why, even though John’s preaching was of the “fire and brimstone” variety, the people are nonetheless filled with expectation. And then Jesus himself takes his place in line at the river Jordan. Other gospel versions of this story show John protesting the idea that he, a lowly prophet, should baptize Jesus. We don’t get that protest here. We also don’t get a description of the actual baptism. Instead, Jesus’s baptism takes place off-stage; it happens as a matter-of-fact. In Luke’s story, after Jesus is so casually baptized, he is praying. Jesus’ prayers are often the openings to incredible revelations, and this is emphasized in Luke. This is first of many incidents of prayer leading to important crossroads or dramatic events. Jesus’ prayer here results in pulling apart the division between the heavenly realm and Earth, and elicits God’s praise and acknowledgment of Jesus as Son. This is a reminder for us all about the power of prayer, and how vital it is for our spiritual life to engage in a practice of prayer, of conversation with and listening to God. The heavens open- releasing the Holy Spirit to guide Jesus’ ministry. And when we pray, we enter into that sacred space too between heaven and Earth. 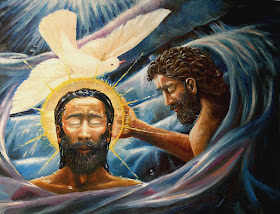 Thus, when Jesus prays immediately after his baptism, the heavens are opened, and a voice comes from heaven, saying: “You are my Son, the Beloved; with you I am well-pleased.” For us, baptism is emphasized as the initiation ritual for entering Christ’s one, holy, universal church. Especially since we practice infant baptism, we don’t emphasize baptism as a way to wash away sins. We emphasize that the action that washes away our sins, instead, is true repentance—turning away from the easy sins, like complacency or pronounced powerlessness in the face of evil, and determining instead to deliberately choose life and witness that God is greater than human contempt and selfishness. Yet there are still some parts of the Christian Church that teaches that baptism washes away one’s sins. And you know, a question arises: if Jesus is without sin, why does he undergo baptism? Perhaps one way to think of this is that Jesus is seeking a mikveh—a ritual immersion used in Judaism for consecration. Mikvehs established ritual purity. The requirements were that the water preferably should be “living” or free-flowing water from a stream or river, if at all possible. This is why the other gospels tell us that John was baptizing in the Jordan. This is also why every baptism we perform at St. Martin’s, like the one we will celebrate during the bishop’s visit, includes a drop of water from the Jordan river mixed into the other water. Although mikvehs were used after coming into contact with uncleanliness and illness, it was also used to purify and consecrate priests. “Christ” means “anointed one.” For Luke, Jesus’ baptism itself is not that important—he shares it with others (and is baptized toward the end of a group of people). 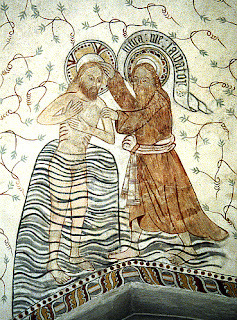 In his baptism he is not so much set apart in Luke’s story; rather he is anointed to take up the full ministry he has come among us to do: to reconcile us, to reveal who God is to us in a way that we can understand, and to show us how to live our lives to the full potential of our humanity, which is God’s dream for us all along. A dream we so often fall short of. A dream that God still has for us, and to which God calls us to return. Jesus comes among us to reveal how to fully embody and claim our humanity, made in the image of God. In Luke’s story we are reminded that Jesus is BOTH God’s son, and is one of us. In taking his place among others as part of a group of people being baptized, Jesus reminds us of his solidarity with us, of his experiencing all the things we do. We are called to the imitation of Christ is all our ways. 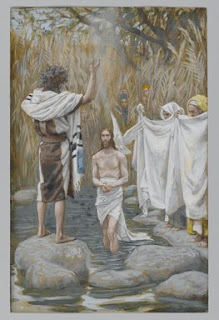 Through baptism, through imitation of Christ, through prayer to strengthen us in our own path of discipleship, we know that we too have heard a voice calling to us: “You are my child, the Beloved; with you I am well-pleased.” With these words, God claims Jesus publicly as God’s Son, and inaugurates Jesus’s public ministry among us. We hear God’s enduring delight in those who do God’s will. 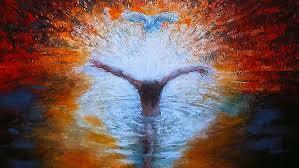 If we had been able to meet today, one of the things we would have done is to be reminded of our baptism by aperging. So, as we are instead surrounded by about a foot of frozen water, oh irony!-- I ask that you remember your baptism. Remember that you are claimed and beloved by God. God calls all of us God’s children. And what a precious, precious reminder that is! In our baptism, in our life of discipleship, in our devotion to God and to each other: this is how we live out our being claimed by God. 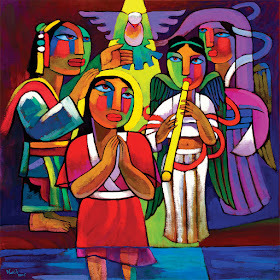 In this Epiphany season, may we continue to open the eyes of our hearts to see the signs of God’s love and faithfulness all around us, the wonders of God’s creation ongoing within us, calling us to renewal and a deeper devotion as disciples and witnesses. May we hear within the heart God’s calling us and claiming us as God’s children, and go out engaged in our own ministry of revealing that wonder to the world. Preached at Morning Prayer via Facebook Live at 10:15 am, Sunday, January 13, due to cancellation of services at St. Martin's Episcopal Church, after Winter Storm Gia gifted us with over a foot of snow. 1) David Zelenka, The Baptism of Christ, 2005, from wikimedia commons. 2) He Qi, The Baptism of Christ, Chinese. 3) David Bonnell, The Baptism of the Christ. 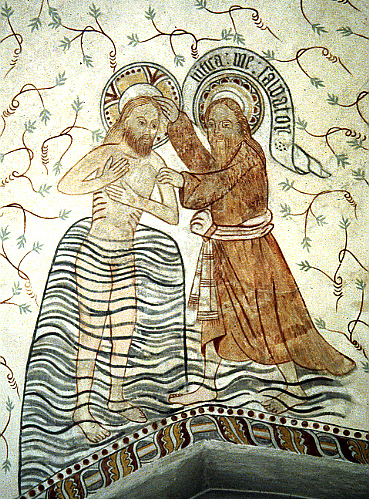 4) Medieval illumination of the Baptism of Christ. 5) James Tissot, The Baptism of Jesus, 19th century, French.